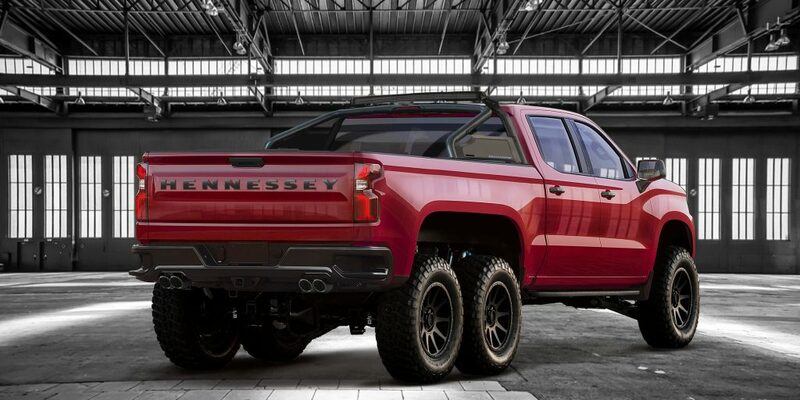 It's not often that we associate a 2019 Chevy Silverado with having six wheels, 800 horsepower, and a $375,000 price tag, but that's exactly what Hennessey has created with its newest monster: the 2019 Hennessey Goliath 6x6. 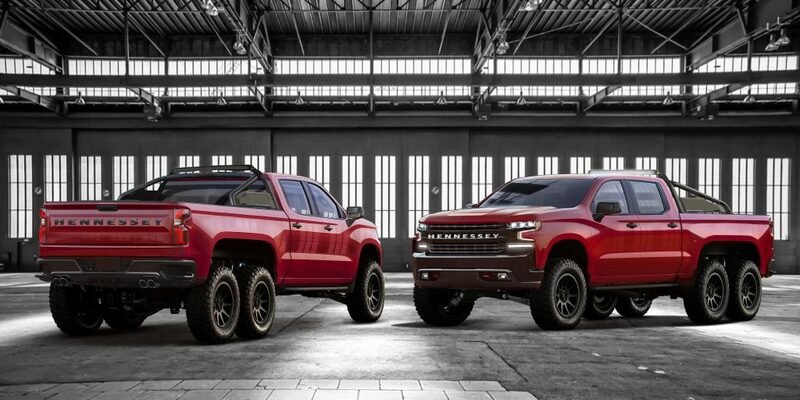 The Texan tuning company has managed to build the ultimate off-road variant of the all-new 2019 Chevrolet Silverado Trail Boss Z71, exactly like they did with the Ford F-150 based Hennessey VelociRaptor 6x6. Under the hood, Hennessey worked its magic on the stock 6.2-liter V-8 which pumps out 420 horsepower and 460 pound-feet of torque by adding its HPE700 upgrade, which adds a massive 2.9-liter supercharger that produces 7 psi of boost. The end result is a staggering 705 horsepower and 675 pound-feet of torque. However, folks who aren't satisfied with the 705-horsepower V-8 will have the option to upgrade to an 808-horsepower stroker motor—and hopefully, that will do the trick. The Goliath 6x6 is fitted with a host of visual and performance upgrades, most notable of which is the addition of a third axle and an 8-inch suspension lift. Additionally, the Goliath also gets 20-inch wheels wrapped with 37-inch BF Goodrich off-road tires, a custom bed-mounted roll bar with an LED light bar, and new bumpers at the front and back. Additional options include a Brembo brake setup and custom interior features that enable customers to make their Goliath 6x6 truly their own. The vehicular monstrosity has a starting price of $375,000, but the good news is that the eye-watering price tag also covers the cost of the 2019 Chevrolet Silverado Trail Boss donor truck and comes with a 3-year/36,000 mile warranty. See, it's not that bad. 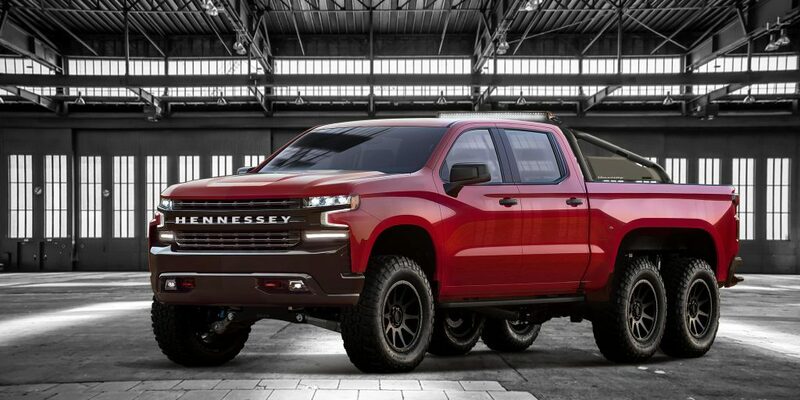 If you are currently in the market for a six-wheeled, supercharged pickup truck with up to 808 horsepower, you better act quickly because Hennessey is only planning on building 24 copies and once they're gone, they're gone.